In Bristol, as in the UK as a whole, there are two main sources of information on road traffic incidents causing injury and involving cyclists. Each has its strengths and weaknesses. Police incident records, known as STATS19 reports, give a specific location for the incident, a series of context details and a brief account of what happened. The reporting Officer also ticks one or more “contributory factors” from a long list to give some sense of “why” things had gone wrong. In some cases, from reading these reports, it’s possible to form a view on who was most at fault. We know, however, that there is a degree of under- or even mis-reporting and that police themselves have some concerns as to the accuracy and consistency of the reports. Some are completed at the scene, others might be done some time later and it is not hard to imagine that on busy days some might not be reported at all. Bristol Council’s Highway and Transport Management Department use the STATS19 data to analyse trends and to rank contributory factors within the city (“failed to look properly” is far and away the most commonly cited factor). They also add the location and summary details of each incident to the map displayed on the Bristol – Pinpoint Local Information page. National data can be explored here on the UK Government data website or here on the excellent CycleStreets collision map, one incident at a time, with lots of detail. 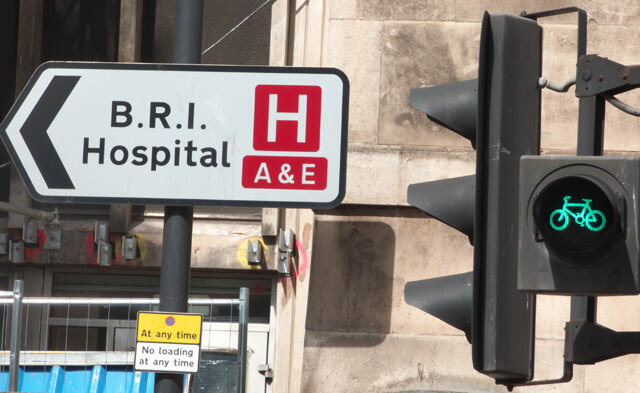 Augmenting the Police data, Bristol City Council’s Directorate of Public Health produce figures for Bristol emergency admissions to hospital due to transport related accidents. These are records of Bristolian residents who arrive at hospital A&E Departments following transport related “accidents” (their choice of word). These figures comprise allBristol residents’ admissions whereever in the country the traffic-related injuries were incurred. They are thought to be more comprehensive than the Police reports but incidents are not identifiable by street location and, while they identify the types of road user, they don’t identify the more detailed factors that might lie behind the road traffic injuries. So what does the Bristol Emergency Admissions data tell us about cyclists and road traffic incidents in Bristol? In 2014 44 Bristol cyclists were admitted to hospital as a result of collisions with motorised vehicles. Separate studies, by BCyC members of incidents in Gloucester Road and Cabot Ward, suggest that a majority of these are associated with motor vehicle drivers “failing to look properly” or some other factor that relates to motor vehicle driver behaviour. As well as these casualties, 113 more cyclists were admitted to hospital as a result of non-collision transport incidents. Given the lack of narrative or the identity of specific locations, it is difficult to pin down causes and propose remedial actions for these non collision accidents but road surfaces (that could be remedied with prompt action) are associated with a significant proportion. Plotting them against time of year shows peaks in December and June. A 2010 survey, biased towards commuters, suggested that 25% of incidents were the result of ice but that still leaves a large number unaccounted for. As far as trends are concerned, in the last five years an average of just under 40 Bristol cyclists were hospitalised each year as a result of collisions with motorised vehicles. This compares with an average of just over 27 per year between 2003 and 2007 (the earliest years for which we have figures). While it is difficult to accurately adjust these figures to allow for the increased level (perhaps a doubling) of cycling in the city, they would not seem to suggest that cycling has got more dangerous. On the other hand it cannot be said that they demonstrate a clear “safety in numbers” effect either. With regard to pedestrians, in 2014 73 Bristol people were injured as a result of collisions with motorised vehicles compared with 5 injured in collisions with cyclists. Put another way, 93.5% of pedestrians admitted to hospital were injured in collisions with motorists compared to 6.5% injured in collisions with cyclists. The latter figure includes those injured when stepping off the pavement and into the path of cyclists as well as those injured by pavement cyclists (it is not possible to break the figures down any further). The figures do show that the overwhelming number of pedestrian casualties are caused by collisions with motorised vehicles and, because lower collision speeds cause lesser injuries, provide clear evidence of the need for 20 mph enforcement, even if there was no reduction in the number of collisions. Injury increases with mass and with velocity and every day in Bristol there are, on average, 5 Police reports of road traffic casualty incidents of one sort or another.